At a joint conference, taking place on 8 and 9 September in Bratislava and bringing together the social partners from the workers’ side – Air Traffic Controllers European Union Coordination (ATCEUC) and European Transport Workers’ Federation (ETF), the employers’ side – Civil Air Navigation Services Organisation (CANSO), as well as representatives of professional organisations and other stakeholders, the representatives discussed the outcomes of the joint air traffic management (ATM) social dialogue project co-financed by the European Commission and adopted a joint statement. 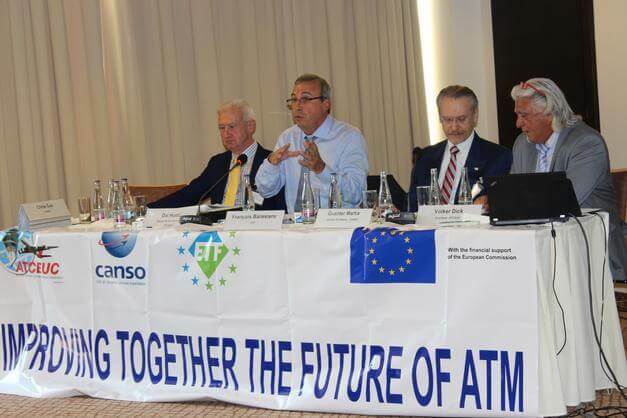 In view of the fundamental changes that European air traffic management is undergoing, the three ATM social partners confirmed the need for a genuine and effective social dialogue to facilitate the implementation of solutions understood and embraced by workers and management alike. To this end, the social partners have jointly produced the Toolbox for Successful Social Dialogue in ATM and noted the European Commission’s support for this instrument. The social partners welcome the new Regulation (EU) 376/2016 on occurrence reporting. However, they stress that a real safety culture requires not only complying with regulations but also a genuine cultural change. Therefore, they call on the Commission to continue its work on the implementation of Just Culture. To support the process, the social partners will soon adopt a joint Just Culture toolkit. It will help to promote Just Culture within an organisation and towards the wider community, as well as increase the systemic safety of the ATM industry. New technologies (e.g. remote air traffic control towers, space based surveillance, digitalisation) have an impact on the human in the system in many different ways, including on social level. The social partners have also looked at the potential consequences of these developments and concluded that everyone has to embrace the necessary changes in order to be effective. The social partners presented the Task Safety Impact Assessment Tool (TSIAT), the result of a collaborative working relationship between employers and workers’ representatives. This tool provides a risk model for assessing and quantifying the safety impact of a task on the ATM/ANS system. The methodology will help ensure that safety improvement actions achieve the desired results. The social partners intend to work with the European Aviation Safety Agency on implementing this technique as a measure for the impact of their proposed safety improvement actions.